Handling Tug Supply vessels. Standard ratings are 100, 200, 350, 500 and 750 metric tons and all units have Quick Release at the rated load. Smith Berger flexibility allows us to customize our equipment to suit the operating characteristics of your vessel. Third party certification, load tests, release tests and load monitoring systems are available options. Rely on the 100 year history of Smith Berger to outfit your vessel with our rugged and dependable equipment. 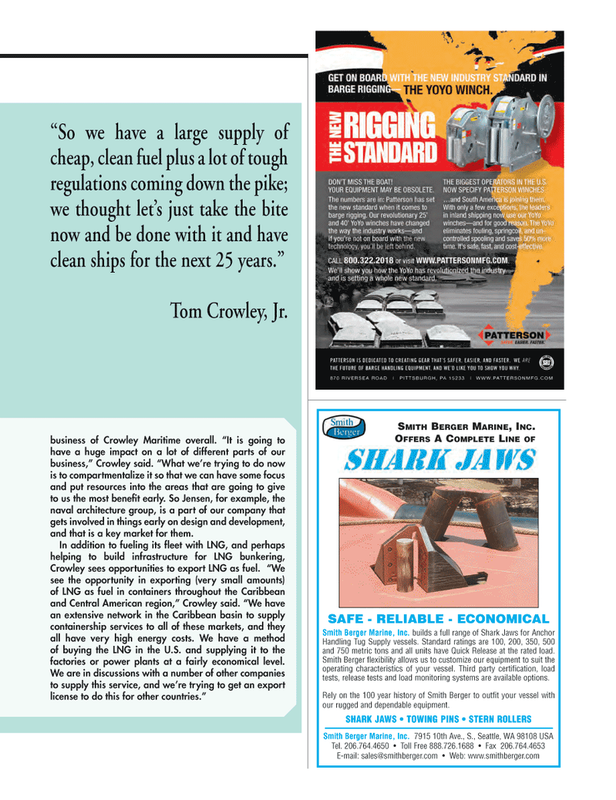 SAFE - RELIABLE - ECONOMICAL business of Crowley Maritime overall. “It is going to have a huge impact on a lot of different parts of our business,” Crowley said. “What we’re trying to do now is to compartmentalize it so that we can have some focus and put resources into the areas that are going to give to us the most benefi t early. So Jensen, for example, the naval architecture group, is a part of our company that gets involved in things early on design and development, and that is a key market for them. Crowley sees opportunities to export LNG as fuel. “We see the opportunity in exporting (very small amounts) of LNG as fuel in containers throughout the Caribbean and Central American region,” Crowley said. “We have an extensive network in the Caribbean basin to supply containership services to all of these markets, and they all have very high energy costs. We have a method of buying the LNG in the U.S. and supplying it to the factories or power plants at a fairly economical level.